Add a fantastic media centerpiece to the living room in your home with this three piece entertainment center. Featuring a myriad of storage options, including four drawers and twelve shelves, as well as metal framing and an Oak finish over Poplar hardwood solids and Oak veneers, this classy, sturdy and stately entertainment center will be a lasting addition to your home. The Modern Craftsman 3 Piece Entertainment Center by Home Styles at AHFA in the area. Product availability may vary. Contact us for the most current availability on this product. Case Construction Poplar solids with Oak veneers, completed in an Oak finish. 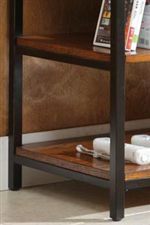 The Modern Craftsman collection is a great option if you are looking for Traditional furniture in the area.